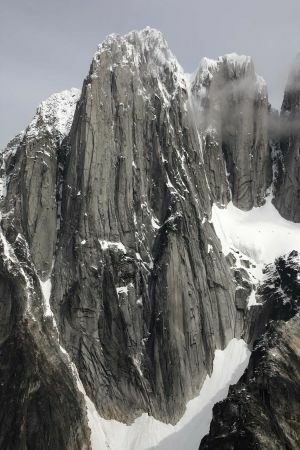 This peak is #43 on the Height List for British Columbia .This large rock massif contains three distinct peaks: North Tower, Central Tower, and South Tower. Collectively they are known as the Howser Spire. To confuse things even more, another completely separate mountain 3 km to the southeast is named Howser Peak. It is named after Howser Creek and the town of Howser on Duncan Lake. The Howser Spire massif contains the highest and westernmost of the Bugaboo spires, located at the southwest corner of the Vowell Glacier. Using the common approach from the east, the massif only becomes visible when one reaches Bugaboo-Snowpatch or Pigeon-Snowpatch col. The west face is a 1000-m sheer drop into East Creek which flows out into Duncan Lake. The only Class 4 scramble route is on the North Tower. All other routes on the massif are Class 5. The glacier approach can at times be challenging. Name Notes: Adopted in 1962.